Conjure up all the romance and flavour of the old Spice Route in this delicious Indonesian dish. Using a sharp knife, cut each chicken thigh into 2, lengthways. Immerse 12 bamboo skewers in water. Place the remaining ingredients into a mini processor, or mortar and pestle, with 2 tbsp cold water. Blend until the mixture forms a rough paste. Rub the paste over the chicken and coat completely. 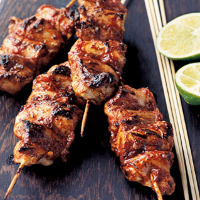 Start threading the chicken onto the skewers, weaving two pieces of chicken lengthways onto each one. Warm a griddle pan over a high heat. Cook the skewers for about 15 minutes, turning frequently, until they are browned, there’s no more pink meat, and the juices run clear. Serve with egg noodles and stir-fried vegetables.